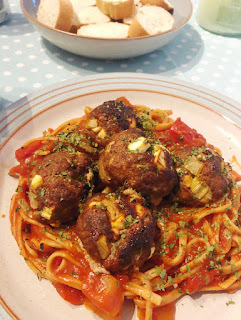 Blonde Ambition: Feta Stuffed Meatballs! Preheat the oven to 200 degrees celcius, and line a baking tray. In a large bowl mix together all of the ingredients well. Place the meatballs a few centimetres apart from each other and bake for 20-25 minutes. Allow them to cool and any juices to settle for a few minutes, and then serve!